Cast: Joaquin Phoenix, John Travolta, Robert Patrick, Jacinda Barrett, Morris Chestnut, Billy Burke, Balthazar Getty. In a nutshell: A Baltimore firefighter's career. Have you ever eaten at a Little Chef and come out thinking, "bloody hell, that was actually pretty good?" Well, no, neither have I, but imagine it with me for a moment. You're expecting it to be bland inedible crap, so when it turns out to be average food, you're pleasantly surprised and it ends up a good experience. It's the same with movies - expectation is critical to a moviegoer's enjoyment. Go into a theatre to see a mega-hyped movie and you'll nearly always be at least a little disappointed even if it was a good movie. For me, Ladder 49 was a meal at a Little Chef, because I was expecting it to be run-of-the-mill sensationalist garbage. In many ways it is, but it's done sensitively and professionally, so I ended up totally riveted. 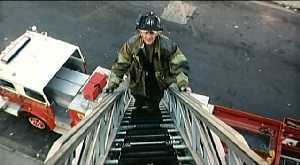 Ladder 49 is a poignant human interest story following the career of Baltimore fireman Jack Morrison (Joaquin Phoenix). It's been done before in Backdraft, but this is a simpler, more real story, focusing on the human elements of being a firefighter and a member of a firefighter's family. Along the way we see plenty of fiery situations and how they are dealt with from an emotional perspective, if not from a technical one. The movie opens with a large warehouse, clearly very much on fire - computer effects may be excellent these days but you can still tell the real thing when you see it. Phoenix is injured in the opening scene, leading into extensive flashback scenes as we trace his life from joining the force until the present day. The family bonds within the fire service are built by showing us the mickey-taking and practical jokes played in the station, under the fatherly watchful eye of station captain John Travolta. We see Phoenix's relationship with Jacinda Barrett take place and we share her torment of wondering whether her husband is going to return home each night. It's the emotional elements such as this that make the film, we care about the characters and we try and justify their choice of profession. Is it worth risking your family's happiness for the sake of other families? It's a tough call to make, and all firefighters have to make it. Adding strength to the story, as Phoenix lies hurt on the floor waiting for rescue and whiling away the time by working out how much his name is worth in Scrabble (probably), we travel back into his imagination again and see him learning his trade in the many flaming buildings of his past. The sense of adrenaline and confusion is captured well, as is the elation on saving someone from certain death, and the fires are portrayed realistically, rather than the slightly artistic approach used in Backdraft. John Travolta seems slightly out of place as the captain and doesn't deliver his usual signature charisma - a far cheaper actor could have done a better job - but it doesn't detract, and Phoenix is spot-on throughout as an uncertain man trying to find his place in the world. Is it better than Backdraft then? Far better - it's in a different league. It's Hollywood budget with a simple but sensitively written script, with a dollop of action thrown in. It's a beautifully made lasagne where I was expecting cardboard and ketchup. Not a classic, mind - the lasagne might be a little underdressed in Gordon Ramsey's restaurant, so don't go expecting The Godfather or anything - and it will be criticised by others for being nothing more than Hollywood tosh - but take their rantings with a pinch of salt. It is Hollywood tosh, but it's very well made Hollywood tosh, and as such it's well worth an evening's viewing. Testosterone Satisfaction Rating: 2/5 Some flamey heroics. To enjoy this film you should: want a simple human story.